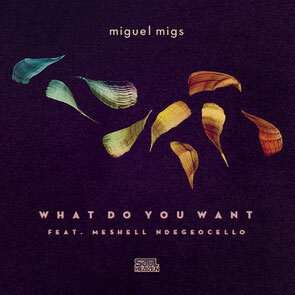 Following the release of his album ‘Dim Division’ last October on Soul Heaven, Miguel Migs is releasing three new re-works of his track with Mishel N, entitled ‘What Do You Want’. With the Salted Vocal mix from himself and a Remix and Dub from Rodriguez Jr the release also includes the album version of the track. The Migs Salted Vocal has more of a club feel than the original, the bassline is more prominent with the dancefloor certainly in mind. Rodriguez Jr’s remix gives the track a darker, edgier sound, keeping the vocal but completely changing the sound to something techier than the melodic original track. Again in his Dub, Rodriguez Jr transforms the track, taking the original tune and stripping it down to basics before the techy, bassier climax of the track. The album version is an example of how Migs likes to take different genres to “make something cohesive”, the soulful vocal with hints of both jazz and the house beat create an individual track. It’s out on Soul Heaven 19 January, check it out below.